Luminato has only just begun and one must-see show has already appeared. That is Cineastas written and directed by Argentine playwright Mariano Pensotti. The fascinating play had its world premiere in Brussels in 2013, which has seen three previous works by Pensotti. We have to be grateful to Luminato for finally making Pensotti known in Toronto. The play, brilliantly directed and acted, will remind many of the early work of Robert Lepage before he started to become enamoured with stage technology at the expense of human experience. 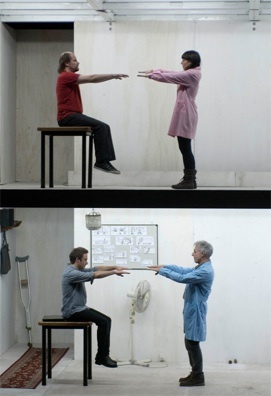 Pensotti uses two performance spaces in a cube horizontally divided in half. 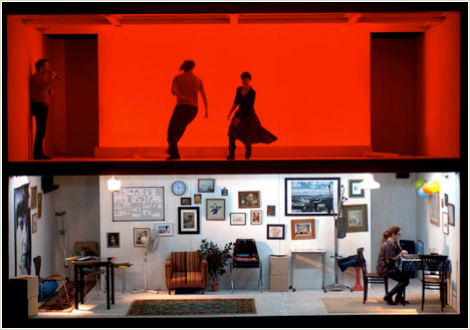 Lighting designer Alejandro Le Roux lights the two spaces quite differently so that we never assume the top space is ever the second storey to the lower space’s first storey. This is important because the two spaces have quite different functions. Pensotti’s play follows the lives of four filmmakers in Buenos Aires in the lower space and simultaneously shows us the films they working on in the upper space. It’s a simple yet ingenious idea idea that Pensotti and his troupe execute flawlessly. What Pensotti explores is the interplay of reality and fiction in both the characters’ lives and in their films. Javier Lorenzo plays Gabriele, a maker of popular films with well-known actors. After he is diagnosed with a terminal illness, he becomes unhappy with the his present film, and, much to his producers’ consternation, turns it from a comedy into a reflection of his own present experiences with the hope that it will serve as a means by which his 2-year-old daughter will come to know him in the future. Valeria Lois plays Mariela, the adopted child of Russian parents living in Argentina. Her latest project is a documentary examining the breakup of the Soviet Union and emergence of the Russian Federation by looking at the change in the popular musicals produced there from 1980 to 1995. The fact that she has become pregnant by one of her advisors leads her to seek out what she imagines as her origins in Russia. Juliana Muras plays Nadia, a lesbian filmmaker whose first film has become a major critical success. She has received funding for her second film, but it seems that the happiness she now feels has stilled her creative instincts. Frustrated with her lack of progress the French producers send her a script to film to which she has serious political objections. The film concerns the return of an aged desaparicido (one of the 10,000 to 30,000 people who “disappeared” during the period of state terrorism in Argentina between 1976 and 1983). The film is about how two brothers have difficulty adjusting to the reappearance of their father (Horacio Acosta). Nadia’s objection is that the plot plays into the hands of right-wingers who deny that any of the desaparicidos were killed. In the one comic story, Marcelo Subiotto plays Lucas, a low-level employee at McDonald’s who steals money from the outlet where he works in order to make a film exposing the ills of a multinational company. His film is about a young man (Javier Lorenzo) who one day is kidnapped by unknown assailants and forced to hand out McDonalds leaflets. Every day they return him to his prison in their cellar. Whatever rage first motivated Lucas against McDonald’s begins to evaporate as he begins to rise in the company hierarchy. Pensotti cycles through each development in the four characters’ lives and their films as a myriad of parallels and contrasts begin to appear, far too extensive to be taken in at only one viewing. Pensotti shows us the diverse ways in which life influences fiction and vice versa. He is not interested in leaving us with the paradox that we can’t tell one from the other. His very set design precludes that. But he does want us to realize how important the interplay is between the two. Even more interesting, Pensotti explores a question more often posed in poetry than in plays. This is the contrast between the transitory and the eternal, or more specifically the irony that works of art live long after their creators’ deaths. This is not a new observation. After all ancient Romans used the phrase, “Ars longa, vita brevis” (“Life is short, art eternal”). But Pensotti presents us with four different ways in which the filmmakers lose control over the films that will represent their lives. What then actually determines how we are remembered? All five actors serve as miked narrators of the unmiked events they discuss, often talking over the unmiked lines. Sound designer Diego Vainer fades us into and out of the narration so that we hear the spoken unmiked dialogue whenever necessary. The complexity of this fact plus the fact that only five actors play all the roles in both the scenes of reality and of film makes this a tour de force of ensemble acting. Surtitles projected on the ceiling beam that separates the upper and lower areas makes the story easy to follow. In many ways Pensotti explores many of the same themes that Robert Lepage did in his 8 1/2-hour-long epic Lipsynch (2008) except more succinctly (in only one hour and 45 minutes) and with greater clarity. After Cineastas you will want to see more work by Pensotti and his extraordinarily talented troupe. Lets hope that sometime in the near future Luminato can fulfill that wish. Photos: (from top) Javier Lorenzo, Marcelo Subiotto and Juliana Muras (above), Varleria Lois as Mariela (below); Marcelo Subiotto and Juliana Muras (above), Javier Lorenzo as Gabriele Acosta as the Doctor (below). ©2013 Grupo Marea.